Looks like some members of the group are adjusting better than others to sanctuary; and then some are just really good at scaring the hell out of little kids. Do you ‘forget’ the hells out outside and enjoy, or forget what this place seems to be? Do you choose death or cookies? All this and more in this week’s Closer Look. It’s no coincidence that an episode titled “Remember” would be followed by an one entitled “Forget”. Last week’s episode dealt with the group divided over some ‘remembering’ what its like to be human while others try to ‘remember’ what the world is actually like despite the illusion of this paradise. Similarly, this week’s episode was all about the groups ability – or inability – to forget what life was like before and all the hassle of this new world. While some can put the past behind them, others aren’t able to forget; and both of these paths have their own trials and consequences. The biggest focus of this episode was all about ‘letting yourself forget and learning to enjoy’ – as Deanna’s husband put it. We saw Abraham and Rosita looking cute and giving the party a shot as well as Glenn helping Noah feel welcome at the party. Rick, who was just thinking of overthrowing the group, now feels a part of them and gets an ‘A’ stamped on his hand. Everyone is casting off their wild natures and trying to blend into this new new world. We’ve seen people eaten, savage battles and other horrible situations in these shows; but they always fit. The cocktail party was perhaps the most out of place thing we’ve ever seen on The Walking Dead and it takes the group off guard as well as many adjust and become ‘domesticated’. Even Darryl shows signs of getting domesticated. Notice how he ate spaghetti, wiped his mouth on his sleeve and then used a napkin. He can be taught! Though it’s Michonne who has to adapt the most, not because she was the most untamed; but rather because this was her idea after all. She was the one who vouched for this place and said the group needed it. So putting on a simple dress isn’t enough. This is why she hangs her katana up. She’s putting the old life behind her; but at the same time still keeping it within reach. Just as Abraham said, you have to pray and be ready to not use your skills again; but at the same time pray that you never get used to NOT using them. 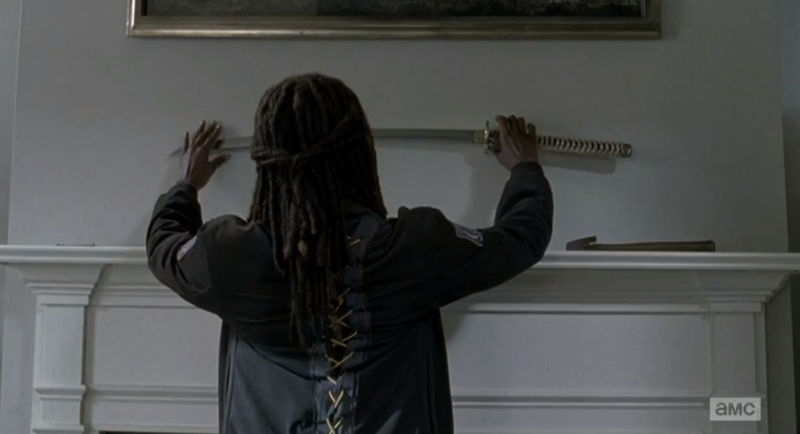 By hanging up her sword, Michonne simultaneously acknowledges the safety of the zone while still reminding herself of the need for a weapon. Sadly, not everyone is able to move on and ‘forget’ what they’ve been through. Noah felt uneasy at the party and Carol is still playing ‘soccer mom’ and secretly arming the group. Though it is Sasha who is most unable to forget the past. Her and Darryl actually offer a good point of contrast for each other as he is able to let the fight go more than she is. Still plagued by the loss and death all around her, she can’t cope with this new way of life and sees it as trivial and meaningless. 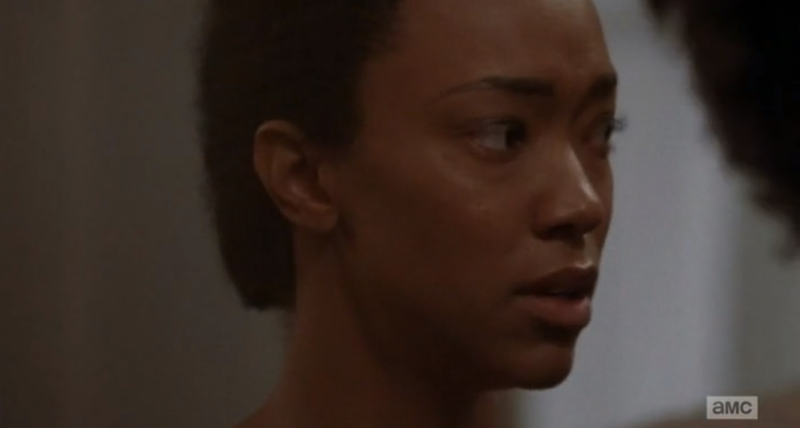 Sasha going outside the walls not just to stay sharp, but she seems to want the walkers to find her. She can’t let the fight go and wants to rage as much as possible – just like we saw in “Them”. It is this outlook that makes her the most unfit to live within Alexandria; but also their greatest possible asset. She wants to be on watch as much as possible and with an impending attack, she could be invaluable. Sadly, her outbursts and inability to fit in might impede her from getting that role. Fans of the comic will know that Buttons the Horse is much more than just a cute name; but I’ll talk more about that in the Quick Bites Easter Egg section below. The true importance of Buttons the Horse is much more than just a nod to the comics; but rather as a telling juxtaposition to the group itself – and possibly a dire foreshadowing of what’s to come. As Darryl and Aaron chase after Buttons, we hear about how Aaron has long tried to bring this horse into the community; but it’s always run away from him and evaded capture. It’s not until Darryl approaches Buttons that the horse calms itself and opens itself to the idea of ‘capture’. While this all plays out, Darryl explains that the longer you’re out side, the more you become what you always were (an animal) – this could be why the horse is more accepting of Darryl’s help than Aaron’s. Though the problems arise once the horse accepts the idea of domestication. It’s no coincidence that the final scene plays out the way it does; and the once wild horse finds itself trapped within a fenced in area overrun with walkers. As Darryl was saying, when you try to domesticate something, you take away that force of nature in it and change it from what it was. The horse didn’t run in the end because – again, as Darryl alluded to – it was ready for Aaron and them to help it. It lost its edge because it was gated in and ready for domestication, which is the very thing the group has been afraid of this whole time. For all intents and purposes, Aaron was trying to ‘recruit’ the horse much like he did to Rick’s groups – earn its trust, bring it back, etc. If Buttons found itself overrun, then is there a chance this could also happen soon to Rick’s group? Will some members loose their edge and become too comfortable within the walls of Alexandria. We’ll find out soon; but this moment with Buttons was certainly meant to set up a larger parallel/foreshadowing of what’s to come. Though the real question was, was Button’s fate just a foreshadowing to Rick’s group in general or Darryl in particular? Darryl is certainly the most wild and free of the group. Additionally, he’s seemed out of place and on his own the past few episodes so that could spells a death soon. That being said, this episode did give him newfound purpose with Aaron’s request to join him as one of the recruiters. As the member of the group who can always discern friend from foe, human from walker, Darryl’s story has new room for growth in this new world. Then again, with this episode also demonstrating his new openness to living in Alexandria; his fate is anyone’s guess. Will he follow Buttons or remain the unparalleled stallion? Each episode thus far has given us a hint of ‘The Wolves” that we first heard of in the Midseason premier; and this week was no exception as now even Rick himself is aware of the coming threat. 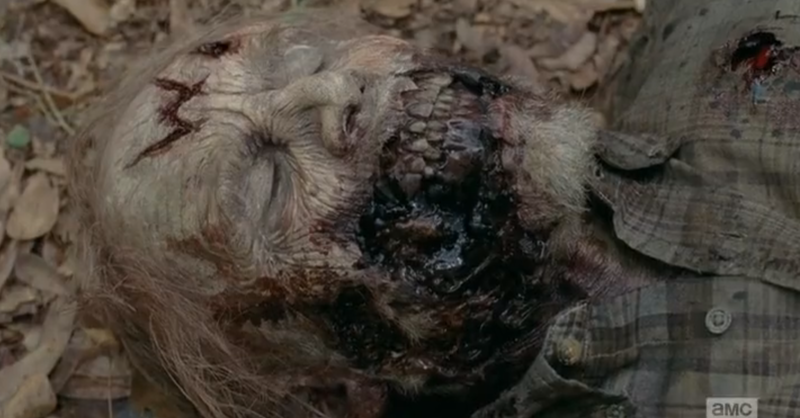 While out on their ‘secret meeting’ Rick notices that the walker Carol shot had a W on its forehead. Carol had to empty her mag with some bad shots, to which Darryl says it’s lucky the walker came around; but that’s not all. Since Carol was purposefully avoiding direct headshots, that’s why there was a chance to really notice the W mark. When Rick sees this mark he immediately remembers the car full of W walker heads he saw when inspecting Noah’s old camp. He knows they’re the same, and the same threat might be near. It’s no coincidence that immediately after this he is telling Monroe to fortify the walls and place guard tower lookouts. The W clan has struck a walled community before, and he knows they could do it again. Whereas last week’s episode didn’t overtly show anything romantic, we could still tell that Rick and Jessie’s interaction was being set up with romantic undertone. It was unclear whether this was to foreshadow a future romance or just give Pete more reason to not like Rick – but then this episode happened. While at the party, Rick takes Judith back and kisses Jessie on the cheek, but anyone could see that this was no harmless kiss. The long linger and look on Jessie’s face reveal that this is the moment she realizes there’s something more to their dynamic. As we learned on The Talking Dead, Jessie and Pete got married because she got pregnant and his drive to become a Doctor has just seemed something he HAD to do to make ends meet. This has led to many bad times in their relationship; and this appears to be one of them. So does that excuse Rick? Well whereas the kiss could be seen as an innocent friendly gesture on Rick’s part, him contemplating about reaching for his gun when he saw Pete with Jessie was not. It’s almost as if Rick has “claimed” Jessie and Pete should pay for even thinking of putting his hands on her. Though with some subtle hints this episode, that might be exactly what happens. With his forceful admission that HE will get them more drinks, you can already tell that Pete is very domineering with Jessie and also possibly an alcoholic. 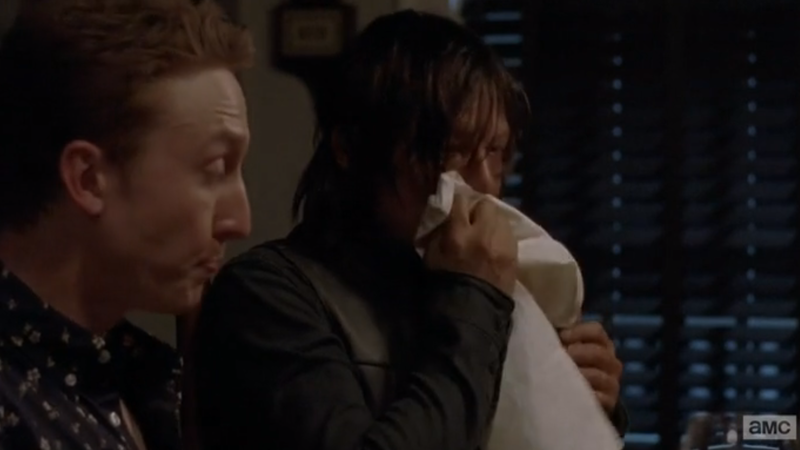 Judging by the preview for next week’s episode, this seems even more likely. Rick might be acting like an animal; but he is still the main character and everything he’s done has been smart. Rick might like Jessie; but perhaps he’s also wise of Pete’s abuse of her. In the comics, Buttons was the Greene family horse which was with the crew through most of the actions of the comics. Sadly, Buttons here didn’t get as much screen time. 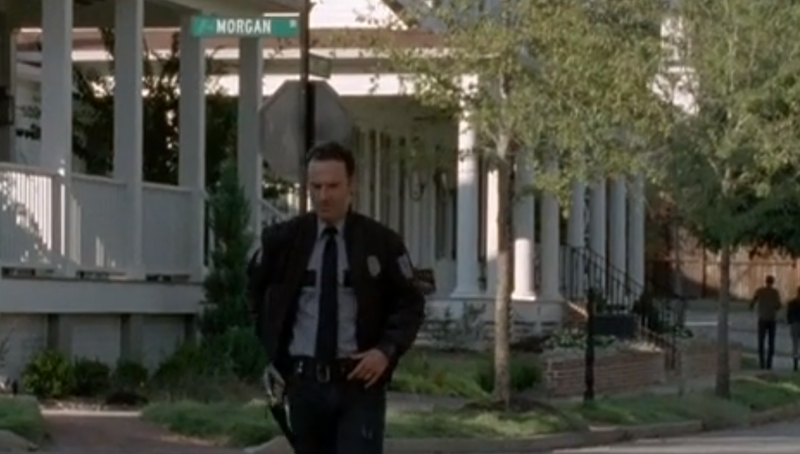 Not the Morgan we were looking for; but we did see that one of the streets in Alexandria is named Morgan. The man who offered to help Carol was named Tobin and is – of course – in the comics. He’s a noticeably cowardly character who’s inadvertently caused a few deaths; but ultimately makes up for it in a selfless sacrifice to alert others to an oncoming attack. The ‘A’ mark isn’t only a counter to the ‘W’ mark on the dead; but also reminds us of Terminus and how Rick’s group were labeled Train Car ‘A’. They really can’t get away from that letter I guess. It’s strange that Rick decides to have his ‘secret’ meeting at a location he just learned last episode ISNT secure since someone saw him hide his gun and took it. Since many of the residents haven’t been outside the walls – or at least not for long – they probably don’t realize that everyone is infected and would turn upon even a normal death. After the final ‘secret meeting’, it’s important to note that Darryl Carol and Rick each take separate route. Yes, this makes sense story wise since Carol has to return the weapons and Rick has to go on patrol; but this also shows their dividing ideas. 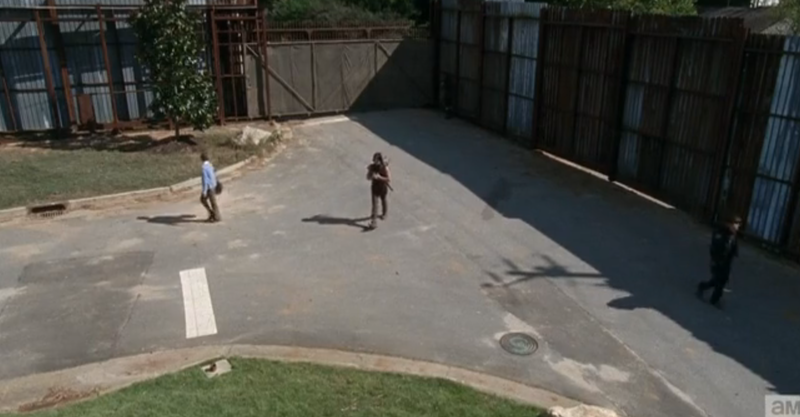 Carol wants to be fully armed, Darryl wants to give this life a chance, and Rick is hesitating. In addition to the last point, it’s also important to note that Darryl took the middle path not because his stance is between Rick and Carol’s; but rather because his is the most level headed – as the other two threatened a child and thought about shooting someone in cold blood in the back. When Rick puts his hand up against the wall, it is unclear if this is him realizing he’s safe OR him missing the outside world. As the walker tries to claw its way in, Rick tries to claw his way out. Look at the cookies Sam, Look at the cookies! Next episode seems to hint at a coming collapse as Father Gabriel tells of how the devil disguises himself as an angel of light and how that false light will destroy everything. Will Alexandria be that false light that leads to their ruin? We also see Eugene talking about how ‘they should have listened’ to him. Considering we haven’t seen much of Eugene and Gabriel, next episode will most likely catch us up with them and how they’re adapting to new life. So stay tuned, Follow Me on Facebook, and I hope you enjoyed this “Closer Look”.